My Little girl loves little figures like My Little Pony, Lalaloopsy, and she loves her dollhouse, we have this Melissa and Doug Fold and Go. I wanted to create another avenue for play with these toys that she loves so much, one that is open ended and can be used with multiple “themes” Felt is a great craft base- it is easy to work with, very inexpensive, and can be used in so many ways. For your base you will need the felt that comes by the yard, all accessories can be made with square felt pieces that can be picked up for $.25 each. 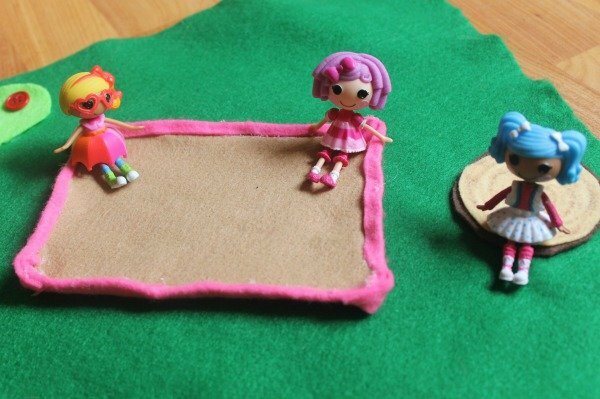 Gather your supplies and set aside a half hour to make your diy felt craft and you will have an adorable handmade gift for your own little girl or to gift for a birthday or Christmas-full disclosure my 6 year old son enjoys playing with this as well. Start by cutting your dark green felt piece in half, You will need to get at least 1/2 yard for it to be deep enough, unless you are planning on making a mini mat. I plan on using the other half to create a mat for my son for his Imaginext and Ninja Turtle figures to play on. My base is now 18″x 30″. For the sand box cut a 6″ x 5″ piece of pink felt and then a piece of tan “sand” colored felt to 5 ” x 4″. Attach tan to the center of pink felt with hot glue. Apply hot glue along edge where pink and tan meet, fold over excess of pink felt, press firmly. Allow each side to harden and set for 20-30 seconds before continuing onto the next side. You can either secure your sandbox to the base mat or leave it unattached so it can be moved around as your child likes. For the additional decorations it is just a simple matter of cutting and gluing. 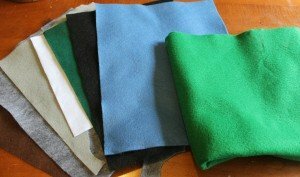 Cut a piece of blue felt to about 8″ long by 4″ wide in an uneven oval pattern to resemble water for a pond, cut rough circles from two shades of gray felt and attach with glue for stones. To make a stone walkway repeat the same procedure you used for pond stones, cut irregular circles from two shades of gray and glue to base. A tree stump is easily made by cutting a 3″ cream circle of felt, and a 3 1/2″ circle of dark brown felt. Glue cream to dark brown and use a brown or black sharpie to draw rings on your stump. Glue in place. Make bushes by cutting uneven circles from light green felt, and glue on various colored buttons for blooms. This play mat has endless options, it can used for many little play sets including little people ,or plastic creatures like the ones that come in TOOBS. It folds up nicely for storage, and is an ideal toy to take with you when traveling, just add a few dolls and it offers hours of imaginative play. To clean your mat when has attracted dust and pet hair simply shake it off, then run a sticky lint roller over it and its as good as new. 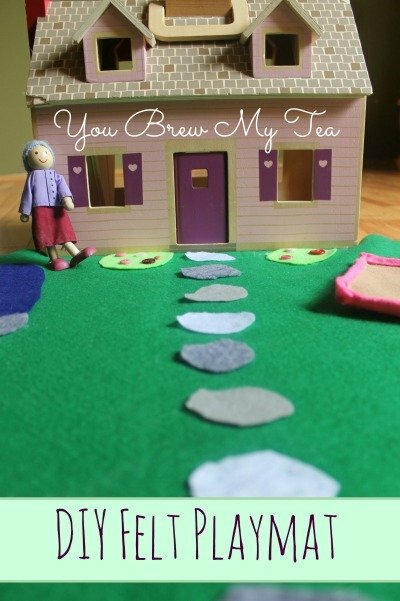 When looking to make inexpensive gifts for the kids, this is a great place to start. 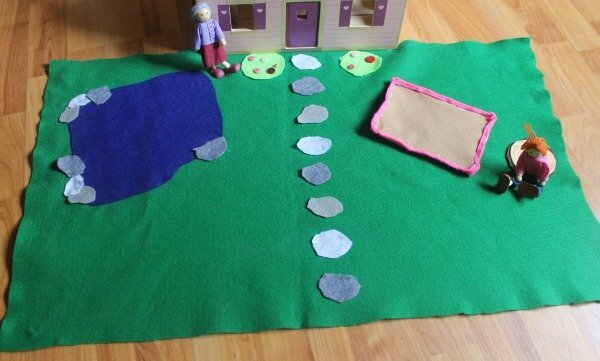 This DIY felt play mat could be easily adapted to give as a gift to any little girl or boy in your life. Imagine how much fun you could have making city roads with felt for your boys and their hot wheels cars too! Previous Post: « Night Before School Checklist + FREE Printable! What a fun thing to make! I love it. 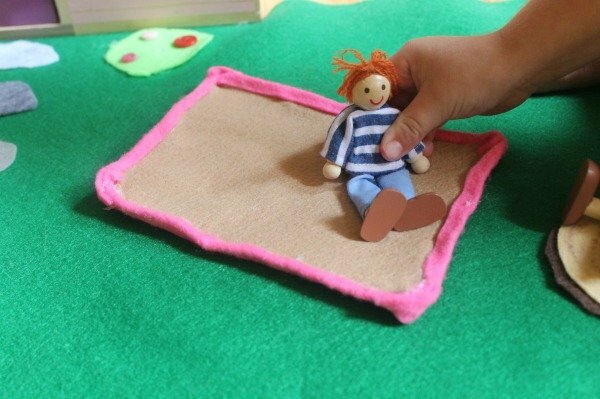 Cute little play mat – and so nice that it’s versatile enough for playing with all kinds of different characters and toys! That is cute. I just found my felt so maybe my daughter and I will have to make that. I love making things out of felt.